Dwarf citrus trees such as oranges, lemons, and limes are living conversation pieces. Their shiny foliage, bright fruits, and fragrant blossoms provide year-round enjoyment. Dwarf citrus trees are well adapted to container growing indoors. 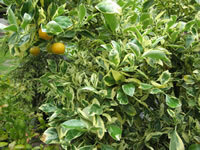 Dwarf Citrus trees are hardy in USDA zones 9-11. They need four hours of full sunshine or VERY bright light each day to grow and ripen their fruit. Allow the plant to approach dryness before watering. Keep the soil moist, but never saturated. Dwarf Citrus have a shallow, spreading root system, so when you are growing them in a container a wide diameter is far better than a deep one. Citrus trees prefer light, well-drained soil that is rich in nitrogenous food like manure or leaf mold. Citrus plants need to be grown in acidic soil. If the leaves turn yellow, the soil needs to be made more acid. To maintain the acidity of the soil, dissolve one half teaspoon of magnesium sulfate (epsom salts) into one quart of room temperature water. Use this solution every two or three months. 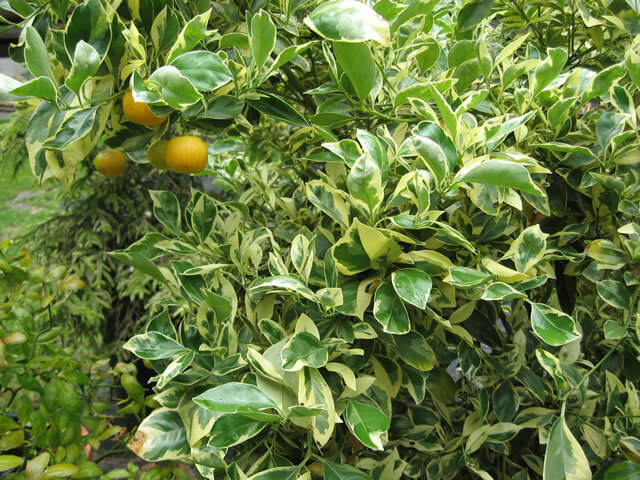 Dwarf Citrus should be fed with a complete acid type fertilizer (Rhododendron food) every three months. In Autumn, fruiting age citrus should receive plant food rich in Phosphorus and Potassium to promote flower development and fruit growth. The idea growing temperature range for Dwarf Citrus trees in the home is 68° to 75° F.
During the summer months, be sure to provide ample water. Dwarf citrus trees require periodic repotting about every third year or so. The dwarfing characteristics of Miniature Orange are the result of keeping the tree root bound in the container, so do not used too large of a planter. When repotting, use a fresh mixture of one-third peat moss, one-third sand, and one-third sterile potting soil. Citrus trees respond well to pruning. Keep all the dead branches pruned off, and thin the plant to the three strongest trunks. Citrus trees are succeptible to plant scale, mealy bugs, and spider mites, so watch out for them, and treat them appropriately. Citrus blossoms are produced year round, but often will fail to develop fruit due to the lack of pollinators. To ensure the setting of fruit, use a small, soft brush to lift the pollen from the stamen (male part of the flower) of one blossom and gently dust it onto the pistol (female part of the flower) in the center of another blossom. Within a few days the pistol should begin to develop a tiny new fruit. It is possible to propagate dwarf Citrus trees from seed. Unfortunately however, seed grown plants will probably never bear fruit. 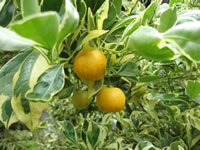 To insure a fruiting specimen, dwarf Citrus trees should be propagated by softwood cuttings.